Home Fashion and Lifestyle Okoye Mmachukwu Chidiogo wins Week 5 of Adandiigbo Beauty Pageant. 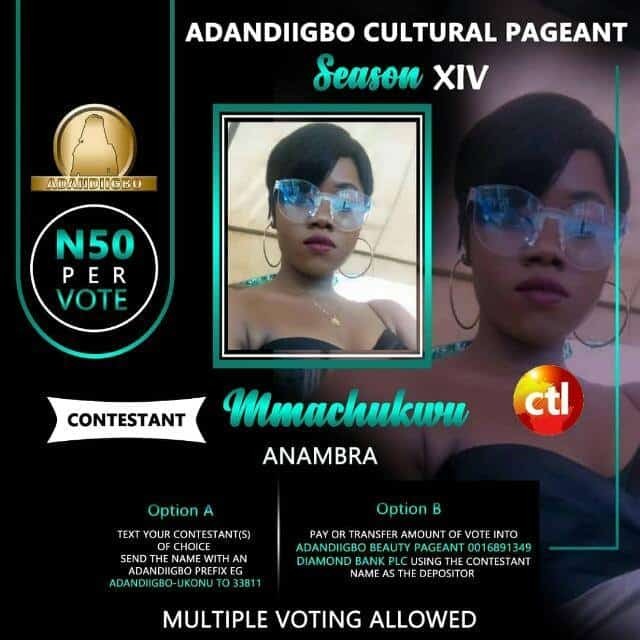 Okoye Mmachukwu Chidiogo wins Week 5 of Adandiigbo Beauty Pageant. 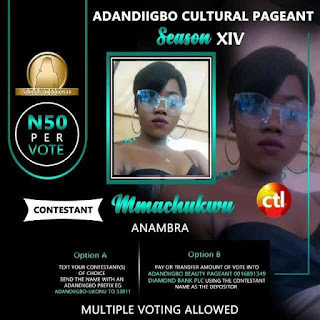 Okoye Mmachukwu Chidiogo wins the Week 5 of Adandiigbo Beauty Pageant voting exercise. She emerged star of the week after outshining nineteen other contestants. Her emergence places her state, Anambra as state to reckon with for the 2nd time in the voting exercise. It would be recalled that Nwaozichukwu Favour of Abia state picked the mantle in week 1 while week 2 was clinched by Joy Chiagozie Felix who also held on to the title for the fourth week as the third week was adjudged a stalemate. With this win Okoye Mmachukwu Chidiogo has scored 2 points extra and would hold the title for a week. The 6th week starts from Saturday, 13th October 2018. This is Season 14 of Adandiigbo - the Most beautiful Igbo girl. The Adandiigbo cultural Pageant is Igbo land's very first culturally themed Ethnocultural pageant designed to promote the Igbo cultural heritage .